O/o The Principal Controller of Defence Accounts (Pension), Draupadight, Allahabad - 211014. Ref:- This office important circular no. C-160, bearing no. G1/C/0199/Vol-l/Tech, dated 16th January 2017. (i) Retired before 1.1.2016 and sanctioned provisional pension under Rule -69 of the CCS (Pension) Rules on account of departmental/ judicial proceedings or suspension. 3. Govt. has decided that provisional pension sanctioned in the above cases may be revised w.e.f 01.01.2016 in accordance with the instructions contained in the DP&PW OM No. 38/37/2016-P&PW (A) dated 12.5.2017. Higher of the two formulations i.e. OM dated 482016 or OM dated 12.5.2017 would be the revised provisional pension w.e.f1.1.2016 in such cases. i. Clear CTC copy of PFC under which provisional pension was initially issued by this office. ii. Calculation sheet of Notional Pay fixtion as on 01.01.2016(in terms of 7th CPC) duly vetted by LAO/PAO. 5. In View of the above, you are also requested to issue suitable instructions (along with copy of this circular) to all the Head of Offices under your administrative control to ensure that application/ claim on the subject matter henceforth are floated in accordance with instructions given in above paras. The undersigned is directed to say that in implementation of the decision taken on the recommendations ofthe 7th CPC, orders were issued vide this Departments' OM No. 38/37/2016- P&PW(/\)(ii) dated 04.08.2016 for revision of pension of pre-2016 pensioners/family pensioners w.e.f 01.01.2016 by multiplying the prc-reviscd pension/family pension by a factor of 2.57. Subsequently, vide OM No. 38/37/2016-P&PW(A) dated 12.05.2017, it has been decided that the pension/family pension of all Central civil pensioners/family pensioners, who retired/died prior to 01.01.2016, may be revised w.e.f. 01.01.2016 by notionally fixing their pay in the pay matrix recommended by the 7th CPC in the level corresponding to the pay in the pay scale/pay band and grade pay at which they retired/died. 2. 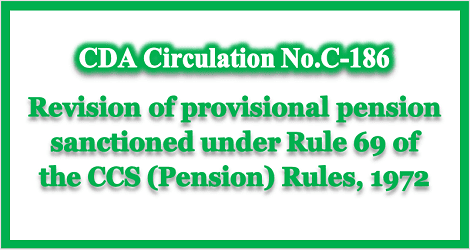 Instructions were issued vide this Department’s OM of even number dated 30.1 1.2016 for extending the benefit of OM dated 4.8.2016 to the following categories of pensioners drawing provisional pension under Rule-69 ofthe CCS (Pension) Rules, 1972. (ii) Suspended before 1.1.2016 and sanctioned provisional pension, based on their pre- revised pay under Rule-69 of the CCS (Pension) Rules on retirement on or after 1.1.2016. 4. This issues with the approval of Department of lixpenditure, Ministry of Finanec ID No.1(21)/II-V/2016 dated 15.01.2018.